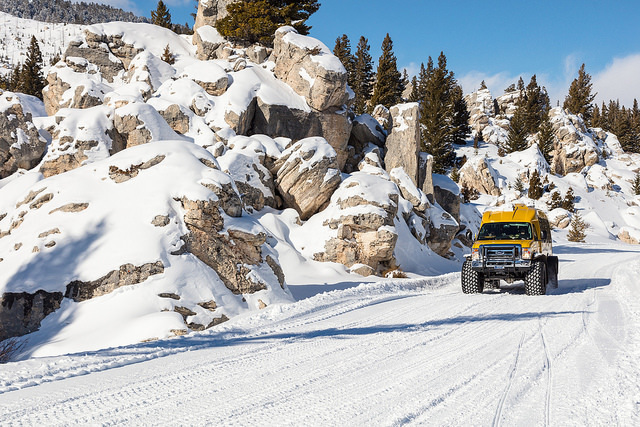 Think of the snowcoach as a sleigh ride to the trailhead, albeit a yellow sleigh, with heat, large windows, and oversized tires that can easily traverse through Yellowstone’s winter conditions. The ski shuttle is the best way to get deep into the park and experience its quiet expanse without having to summon the endurance for a marathon ski. A map is important, but the best place to start is at the Bear Den Ski Shop inside the lobby of the Mammoth Hotel. Ski conditions change daily, and the folks who work in the shop have the best beta around. We arrived in early January with a reservation for a 9:15 a.m. snowcoach shuttle to Indian Creek. After some suggestions from the shop, we quickly changed our plan for the day’s ski, avoiding the ungroomed Sheepeater trail, which hadn’t seen any recent ski traffic and likely would have involved some difficult trail breaking and wind-blown stretches. Our fellow skiers in the 13-passenger snowcoach would spend the day skiing the loops at Indian Creek, which include both groomed and ungroomed trails—some suitable for beginners. Indian Creek is also home to a warming hut with a wood stove and room to eat lunch or play a game of cards, making it an ideal base camp for the day. The snowcoach shuttle would return to pick up these skiers at 3 p.m.
One of the magical things about skiing in Yellowstone is reading the tracks of wildlife in the snow, and the Bunsen Trail didn’t disappoint. Whether you’re ten or forty, it’s still a thrill to trace the meanderings of a mouse, the telltale tracks of a snowshoe hare, the deep prints of bison and elk, and the deliberate line of a bobcat. The skier shuttle from Mammoth to the Indian Creek and Swan Lake Flats runs on weekends in the winter and departs three times a day. Reserve your spot ahead of time and check in at the front desk of the Mammoth Hotel upon arrival. Here, you can visit Bear Den Ski Shop, view their daily ski conditions board, and get suggestions from the staff. They also have rental gear, lessons, and ski tuning services available. There are two main loops at Indian Creek. Shuttle drivers can also drop you off in Swan Lake Flats, if you’d prefer. 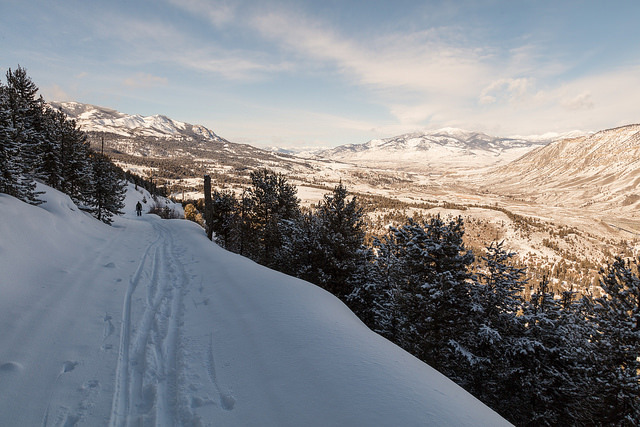 Both the Bunsen Peak Trail and the Snow Pass Ski Trail will take you back to Mammoth if you choose to return on your own two skis. 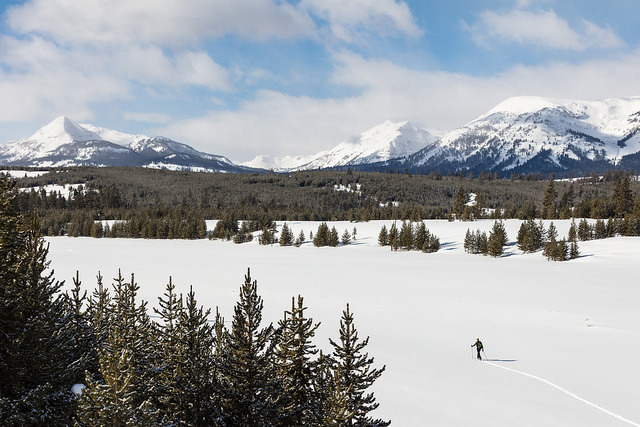 Old Faithful also offers ski shuttles to explore some of the off the beaten path ski trails around Fairy Falls, Lone Star Geyser Basin, or Biscuit Basin. I always ski with a pack of essentials that includes at a minimum food, water, a small first aid kit, a fire starter, and lots of layers. Indian Creek and Swan Lake Flats can be considerably colder than Mammoth and the wind may sweep in. I generally start with a good insulated jacket and take layers off as I warm up during the day. I also carry both a pair of gloves and a pair of warmer mittens. Jennifer White is a writer living in Paradise Valley, Montana. Her fiction and nonfiction have appeared in a variety of publications, from Women’s Adventure to Backcountry Journal, Narrative Magazine, and Conde Nast Traveler online. She has served as an artist-in-residence in Glacier National Park and enjoys calling the Yellowstone region home. Want to experience Yellowstone in-depth? Consider joining our team for a season!